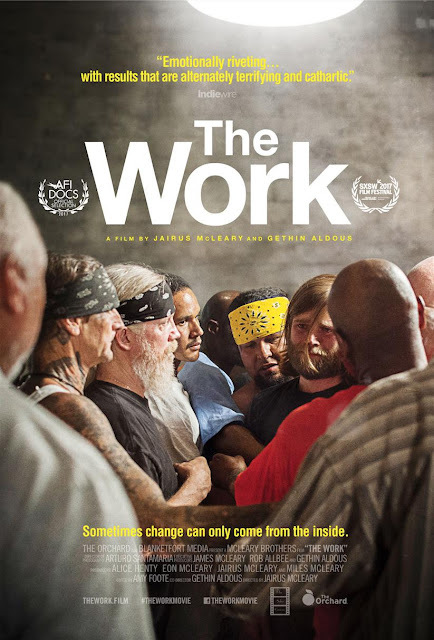 The critically acclaimed documentary feature The Work, from director Jairus McLeary and co-director Gethin Aldous, will hit theaters starting October 20th in New York and October 27th in Los Angeles with more cities following. The Orchard and First Look Media’s new entertainment studio Topic acquired North American rights to the film in April this year. The film from the Grand Jury Prize for Best Documentary Feature at South by Southwest (SXSW) Film Festival 2017 and took home the Audience Award for Best Documentary Feature at Sheffield Doc/Fest 2017. Set inside a single room in Folsom Prison, The Work (88 minutes) follows three men from outside as they participate in a four-day group therapy retreat with level-four convicts. Over the four days, each man in the room takes his turn at delving deep into his past. The raw and revealing process that the incarcerated men undertake exceeds the expectations of the free men, ripping them out of their comfort zones and forcing them to see themselves and the prisoners in unexpected ways. The Work offers a powerful and rare look past the cinder block walls, steel doors and the dehumanizing tropes in our culture to reveal a movement of change and redemption that transcends what we think of as rehabilitation. program multiple times before) adapt to helping" an outsider through his own personal catharsis." Jairus McLeary is a court videographer and filmmaker. The Work is his first documentary. He spent over a decade as a volunteer for the four-day therapeutic workshop, ultimately gaining the trust of the convicts in order to film. Gethin Aldous directs motion capture for a major video gaming company. After his own volunteer experience at Folsom he joined forces with McLeary. This is his second documentary feature. The Work showcases the unique approach of the non-profit Inside Circle, which helps prisoners and parolees heal from the inside. According to the organization, The Inside Circle Foundation focuses on reducing prison violence, lowering recidivism, and guiding inmates through healing that allows for meaningful lives after release.